This report has been published in May 2014 and contains in depth information and data about Raiffeisen Bank International AG and its operations and markets. It contains a company overview, business and strategy description, financial ratios, valuation & forecast dat, SWOT analysis, plus data on key events. 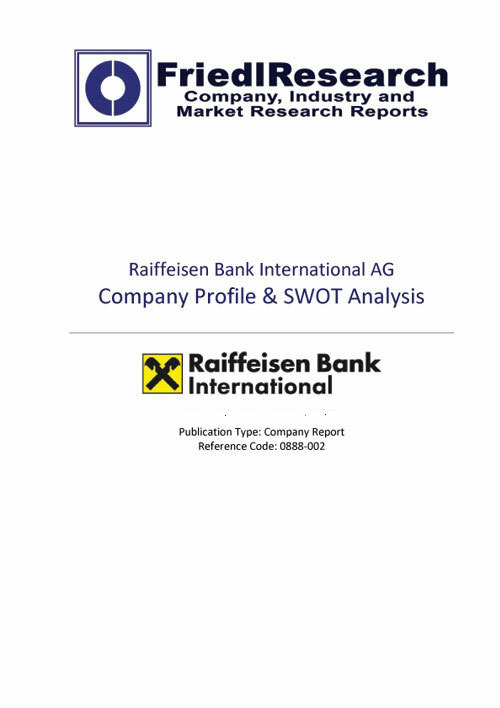 FriedlResearch’s "Raiffeisen Bank International AG - Company Profile & SWOT Analysis" contains in depth information and data about the company, its markets and its operations. The Vienna-listed lender, which is the second biggest in Central, Eastern and Southeastern Europe, has managed a number of difficulties in the last few years: after 15 years of rapid growth rates, RBI´s expansion in the CESEE region came to a standstill in 2008. Particularly the emerging markets of CESEE were hit extremely hard by the financial crisis. Due to its exposure to CESEE, RBI was observed very critically. Within less than two years, RBI´s share price fell by more than 80%. However, RBI performed much better than expected. In the consecutive years after the financial crisis, RBI re-shaped its operations and cut costs consequently. Being able to improve operating figures is only half a solution, however. The whole banking landscape in CESEE has changed substantially. For banks operating in CESEE, economic and political frame conditions are completely different to the situation before 2008. It is therefore not surprising that optimism is far from being back. Events like the political crisis in Ukraine are driving the market uncertainty even higher. For RBI, the situation in CESEE is still ambiguous, as a result. On the one hand, the exposure in some CESEE markets is still the biggest risk factor. On the other hand, deepening the business in CESEE is RBI´s only chance to succeed. Hence, RBI has developed a new strategy. Now, RBI is on the growth track again. However, the lender does not record the same growth rates as in the period from 2000 to 2008. Compared to the years before 2008, the banking group posts solid, but relatively low income. Now, RBI´s main challenges are to keep its strong position in countries like Austria, Russia and Poland, to stabilize its operations in Southeastern Europe and to leave difficult markets like Ukraine or Hungary. The last few years have shown that RBI is able to survive in a challenging environment. The next few years will show whether RBI is also able to succeed.